A few months ago I was at a local USPSA match, and one of the regulars was shooting his new carry gun. This was a custom Commander-sized 1911 chambered in 9mm, and it was just a beautiful gun. It was also a joy to shoot, too, as, even in a slightly reduced size 1911 the 9mm provides almost no recoil. What I noticed most, however, was the trigger pullâ€”I've got an educated finger, and estimated it to be right at 2 pounds. "Isn't that a little light for a carry trigger?" I asked Rob, the proud new owner. "Nope," he replied, and that got me thinking. 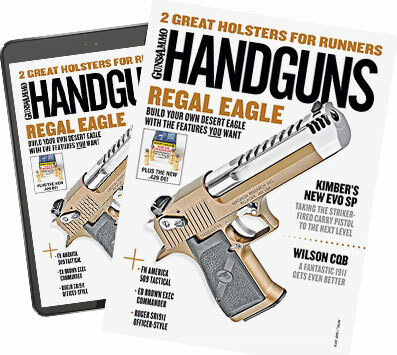 Some well-known gun writers have made their bones writing about how no carry gun should EVER have a trigger pull under 4 pounds. I have continually insisted that a trigger pull so heavy it affects your ability to hit the target quickly is not something to be praised. But how light is too light? Why has 4 pounds become the carry standard? Why not 5, or 4.5 or 4.2379? It is an arbitrary whole number that was chosen because when you start dealing with triggers lighter than 4 pounds in the hands of people who are incapable of keeping their fingers off the trigger, you get negligent discharges. I, however, don't think everyone should handicap themselves because some people are idiots. You are either following safe gunhandling rules, or you aren't. If your training is sorely lacking, and/or you never practice, you are unsafe with any weight trigger pull. The standard Glock trigger pull (with a 5.5-lb connector) runs around 6-7 pounds, but that was WAY too light for some police departments whose officers were sorely undertrained, and had more than several instances of negligent discharges. This situation led to the New York and New York Plus Glock triggers. Instead of improving the training of these officers, the department instead put really heavy triggers in their Glocks. I've spent some time behind Glocks burdened with these triggers, and as far as I'm concerned they don't make the pistols safer. They make the pistols more unsafe. What do I mean by that? When you put a trigger that heavy in a pistol, you have made it much harder to shoot fast and accurately. You are almost guaranteeing the officers saddled with that atrocity will miss what they shoot at. But how heavy (or light) should the trigger on a carry gun be for someone who is trained, and knows to keep his or her finger off the trigger until the sights are on the target? That's the caveatâ€”training. Not just knowing to keep the finger off the trigger, but the gun pointed in a safe direction until it's time to shoot. I think the answer to this is, it depends. I would carry a 1911 with a 2-pound trigger pull before I would carry a Glock with a 2-pound trigger pull. Why? The 1911 has both a thumb safety and a grip safety. The Glock only has a trigger-mounted safety, and the number of accidental discharges with Glocks because of that are numerous. Notice I used the term "accidental discharge," not "negligent discharge." The second is when you pull the trigger and something happens that you didn't intend ("I thought it was unloaded," etc). These accidental discharges I'm talking about are varied. I know of officers re-holstering their Glocks in thumb-break holsters, and the thumb break strap gets inside the trigger guard. As they push the pistol down, boom. I also know of instances where windbreaker drawstrings have gotten tangled in the triggers of Glocks, causing ADs. As long as the pistol is mechanically sound, there is no such thingâ€”theoreticallyâ€”as a trigger pull that is too light. That said, once a trigger pull gets so light that unintended movement or jarring can set it off, it's too light. Where is that tipping point? I'm afraid that's a bit subjective. When it came to the ideal carry-weight trigger pull on a 1911 in the hands of someone competent, Jeff Cooper himself said, "Three pounds, crisp, is the word." Does 3 pounds sound too light? Well, if you don't trust yourself carrying a pistol "X" weight trigger, you shouldn't carry it. Cooper's concern was a pistol that enabled you to survive a gunfight, not the tongue-lashing of a lawyer in a courtroom. Let me be clear: If you find yourself in a self-defense shooting and hit what you're aiming at, the weight of your trigger won't be an issue. If you find yourself in a self-defense shooting and don't hit what you're aiming at, all bets are off whether that trigger was light or heavy. Wouldn't you rather be carrying a gun that has a trigger which doesn't interfere with your shooting so you can hit what you aim at?